Israeli settlers seized a Palestinian home belonging to the al-Halabi family, on Tuesday, in the Old City of occupied East Jerusalem. A Ma’an reporter said that Israeli settlers raided the al-Halabi family home, where an elderly Palestinian couple lives and who were out shopping for groceries, at the time; the couple was thrown out by settlers upon arrival. Palestinian youngsters attempted to defend the home from seizure, however, Israeli police assaulted them and fired tear-gas bombs in their direction. Sources confirmed that Israeli forces detained five of the youth. Their identity remained unknown, at the time of this report. Additionally, the settlers who seized the home pepper sprayed Palestinian residents and students, resulting in a number of severe suffocation cases. 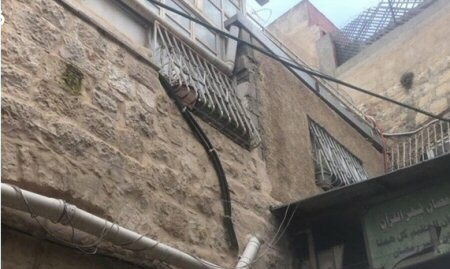 Sources also mentioned that home is located in a Palestinian-owned building which is divided into four ownerships. Two belong to the al-Alami family, the third belongs to the Eshteiyeh family, and the fourth belongs to the al-Halabi family (amounting up to 40%) and measures 100-square-meters.